Hull shape was developed to maximise interior space relative to hull length while maintaining good hydrodynamic qualities. 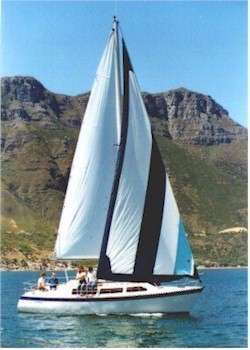 The waterline is fairly fine forward for beating ability but the forward sections flare above waterline to give reserve bouyancy and a dry ride. This flare works with a shallow forefoot and powerfull quarters to give excellent downwind control and speed while also maintaining a balanced waterplane when heeled. Displacement will vary a small amount depending on the construction material chosen but will not be far different from the figure given. Overall this design provides a fast and comfortable small cruiser which is easily handled for short-handed cruising. She has optional reduced draft to get into most anchorages and has ocean crossing capability to get there in the first place. Follow these links to see stability curves for this design with the various keels, a list of drawings and a material list for the round bilge timber and multi-chine plywood versions. Testimonial from Jonathan Savage - Owner of CARIBBEA 30 "G-String". "Just a short note to let you know how chuffed I am with the boat. This trip (he had sailed from Cape Town to the Caribbean) is an ideal one for the Caribbea. Being single-handed I was quite conservative as far as canvassing was concerned. Best daily run was 178nm but had many in the 150s." "Everyone who has been aboard has been very impressed by her spaciousness."